Christy: Satellite data shows Earth's climate is changing unevenly | Watts Up With That? This has been in my inbox for a couple of weeks, so on a fairly quiet day for weather, I thought I’d put this out there. John Christy of the University of Alabama-Huntsville reported earlier this month that the Earth’s climate change over the past 30 years has been rather uneven: It’s gotten much warmer in the Arctic and, at the same time, cooler in the Antarctic. Christy and his colleague Roy Spencer, who are known in some quarters as global warming skeptics, use data from satellites to measure the temperature of the Earth. The more well-known NASA GISS and National Climatic Data Center data sets primarily measure surface temperatures. Overall, Christy found that Earth’s atmosphere warmed an average of about about 0.72 degree F in the past 30 years, according to NOAA and NASA satellites. More than 80 percent of the globe warmed by some amount. However, while parts of the Arctic have warmed by as much as 4.6 degrees F in 30 years, Christy says that much of the Antarctic has cooled, with parts of the continent cooling as much as the Arctic has warmed (see map, above; click to enlarge). “If you look at the 30-year graph of month-to-month temperature anomalies, the most obvious feature is the series of warmer-than-normal months that followed the major El Nino Pacific Ocean warming event of 1997-1998,” says Christy. “Right now we are coming out of one La Nina Pacific Ocean cooling event and we might be heading into another. It should be interesting over the next several years to see whether the post La Nina climate ‘re-sets’ to the cooler seasonal norms we saw before 1997 or the warmer levels seen since then,” he says. He adds that most of the warming found in the satellite data has taken place since the beginning of the 1997-98 El Nino, and that Earth’s average temperature showed no detectable warming from December 1978 until the 1997 El Nino. I find the distortion created by the Mercator projection to always be interesting. The exaggeration takes on a world of its own (pun intended). Could that be explained by soot falling on the snow and affecting the albedo? Much more air pollution in the northern hemisphere than the southern. Antartic cooling might come from an overall small solar magnetic cooling. But, but, but….how can this be when Hansen has a brandy-new plot of Antarctica that shows it’s warmed….??? Why is it that the greatest change is where we don’t have many sensors, and even the statelites don’t cover the poles? Interesting that a man I trust (Christy) is getting warming Arctic temperatures – but NOT in the very, very high reading from Siberia that Dr. Hansen keeps reporting! Chruisty’s much lower readings, over a much wider area, show only a minor 0.4 degree increase in northern Canada. A small increase in Siberia – but certainly NOT Hansen’s “5 degree* increase” reported earlier. ” Perhaps the reporter converted a reported a (too-high) “2 degree C” increase from GISS into an even higher “5 degrees F” ? So, what in the climate models predicted – over a thirty-plus year trend, that Antarctica would be getting colder, that the tundra mud and Greenland is NOT melting, and that we’d have ten years of a cooling cycle? 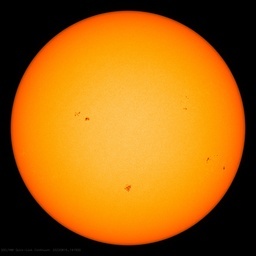 Only 3 sunspots in all of December. Still quiet today. Does this add credence to the theory that high-altitude airliners – which fly predominantly in the northern hemisphere – are causing warming? I believe I can explain why there is such a large discrepancy between the Northern Hemisphere and the Southern Hemisphere temps. As I showed in my guest post of awhile ago, ocean circulation patterns can explain most of the variability. When you adjust this out, the Northern Hemisphere and the Southern Hemisphere are warming at almost exactly the same (low) rate. The NH is affected more by the ENSO and the Atlantic Multidecadal Oscillation (from the northern Atlantic). The AMO had been cycling upward since about 1977 but seems to (perhaps) be trending down now. While the SH is affected more by the Southern Atlantic Multidecadal Oscillation (the AMO’s counterpart in the southern Atlantic) and the ENSO’s impact is very low. The SAMO has been trending down since about 1975. When you use these ocean indices on the NH temps and then the SH temps, there is a very good explanation of the variability. Here are the Hadcrut3 monthly NH and SH temp anomalies going back to 1871. Related to my previous post, I hadn’t realized that Singer authored the “airliner” theory of northern-hemispheric warming. based upon data from Christy and Spencer. FAIRFAX, VA, JUNE 26, 1997—Global temperature data gathered by satellites over the past 18 years–the most reliable data available–have consistently shown a slight downward trend, contrary to climate model forecasts. Analyzing satellite data compiled by scientists John Christy of the University of Alabama and Roy Spencer of the NASA Marshall Space Flight Center, however, atmospheric physicist S. Fred Singer has discovered an unusual and previously unexplained regional warming trend over northern mid-latitudes (which includes Europe and the United States), where commercial airline traffic is at its maximum. In a paper just submitted for publication, Dr. Singer demonstrates that this warming has been increasing in line with the growth of air traffic–a correlation that is particularly striking over the last decade. Unrelated to carbon dioxide emissions or any large-scale “urban heat island” effect, the mechanism, as Dr. Singer explains it, is this: burning jet fuel releases not only pollutants, such as nitrogen oxides and sulfur dioxide, but also large quantities of water vapor, approximately 1.2 pounds for every pound of fuel burned. With airliners routinely flying at altitudes above 30,000 feet, this water vapor condenses into ice particles (contrails) that fade into thin cirrus clouds. These cirrus clouds have radiative properties capable of producing a measurable warming at the Earth’s surface. Interesting that there was no detectable warming from December 1978 until the 1997 El Nino. So for almost twenty years there was no climate change whatsoever. The change has been about .4C since the beginning of the ’97 El Nino. Wouldn’t this type of short term fluctuation be more correctly termed “weather”? The Northern hemisphere warming while the southern cools suggests to me the possibillity of some kind of a long term climatic trend based on subtle changes in the earths orbit. I seem to remember reading somewhere that in the Northern hemisphere summer the Earth is further from the sun than during the southern hemisphere summer. On the other hand, the southern hemisphere is mostly ocean wheras the nothern land. Anyone know how to work this out?? no detectable warming from December 1978 until the 1997 El Nino. Now, through which month of 1997 did Christy plot his data to come to a statement like that, where we know that UAH does not produce proper surface temperature data. I started off from Dec 1978 through Jan 1997 and added 1 month of that year, but all trendlines show a near 0.1C LT increase. To previous post: added 1 months at a time from Jan-1997 through dec-1997! Yeah but hey, it was predicted by the models with a suitable level of confidence, therefore uneven climate change is DEFINITE proof of catastrophic climate change, therefore we should shut down all industry and kill 90% of our population. The lack of warming detected from December 1978 to the 1997 El Nino seems to be in direct contradiction of the work cited in the post below. Could not the Arctic warming that has been observed be a function of the China Syndrome. China has been ramping up Power production, based on coal. Their particulate control is exceedingly poor. How much has been depositing on the Arctic and changing the albedo, and hence reflection of short wave radiation. Getting reliable figures out of China but it would not be ridiculous to talk of increases of power outputs of 20% p.a.. Maybe we should teach them how to use electrostatic precipitaters properly. As we are now finding out, it was much nicer to live where it’s warm. Correct me if i’m wrong but isn’t the alarmist’s argument against the MWP that it was not a global event but local? 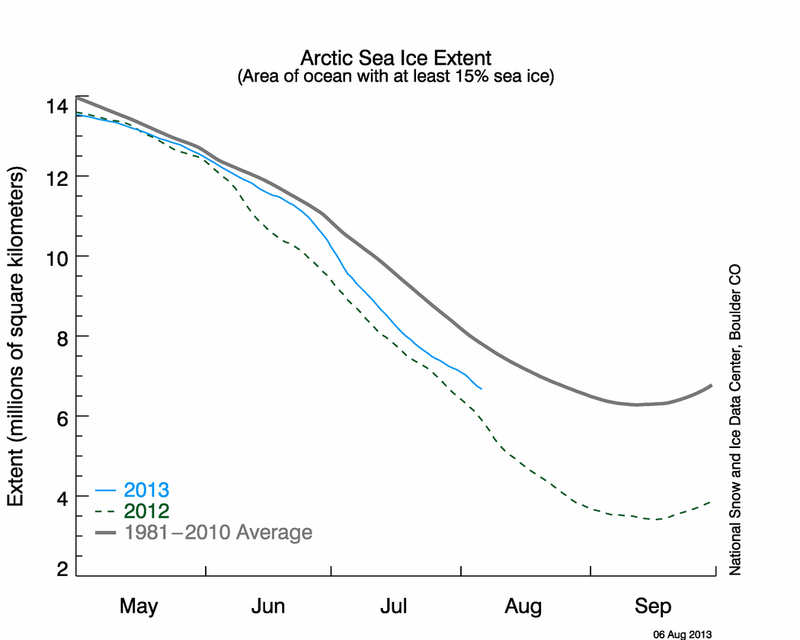 So if artic is warming and the anartic cooling doesn’t this require some kind of concession from the alarmists? I wish people would study Dynamical Systems a bit more, at least until they have a simple understanding of “strange attractors” and how they affect the flow of solutions to a complex dynamical equation. All of this centers on Lorenz’s “Butterfly Effect”..the only thing is that on a large scale, the butterfly is massive bodies of water created by man (much less localized artificial population centers like LA). If you are at all familiar with “Lake Effect Snow” and the tear-like pattern it seems to make behind the “attractor” you can see where I am going with this. I’m going to assert that the creation of Lake Mead changed the “initial conditions” on the earth’s dynamical system. The system settled down, and along came Aswan….then Itaipú and 3 Gorges…and, of course, there was the Grand Coulee. Take a look at this map and imagine the immense change of air flow behind this system..another “repeller,” or “strange attractor.” Another change in the “initial conditions,” another butterfly-effect. Kind of reminds me of the work Hari Seldon did trying to formalize Psychohistory, and how immense the matrix became as people over the centuries added strange attractors and other anomalies to the solution. More data that fails to show a correlation between increasing atmospheric CO2 levels and temperature. Having a 19 year long period failing to show any change in temperatures, should take a lot of explaining away. I’ve a suspicion that the Church of the AGW will simply ignore it. Anthony: I posted a video at my website a week or so ago that illustrated the lingering effects of the 1997/98 El Nino on the East Indian and West Pacific Oceans. It runs just under five minutes, but it goes quickly. I used a sea surface height video from JPL to aid the visuals. The post also includes the graphs (without comments) used in the video. For those with age-imposed vision problems like me, there’s also a YouTube version that can be expanded to full screen. Why did the NSIDC website have ice formation in the Arctic flat-line during mid-December and then, magically, align perfectly with the 2007-2008 data? It seems rather beyond the range of probability that Arctic ice stopped forming for the two darkest weeks in the Arctic. Coastal community temps for the period were well below zero – mostly in the -15 to -20C range. Granted, there could have been a massive incursion of relatively warm waters from the Gulf Stream, but I do not see how that would create a flat line, given additional freezing in other areas of the Arctic. And info would be appreciated. Buggers! That Washington Post report is just about the most alarming “likely not to happen (their words not mine) thing” I have ever read! Based on such an unlikely sure thing we MUST TAX AND SPEND else the unlikely thing will probably not happen or just might, but it’s a long shot sure thing!!!! > I find the distortion created by the Mercator projection to always be interesting. It’s not a Mercator projection, it’s just an unprojected lat/long cartesian grid. Mercator projections that reach the poles are infintely tall. I posted a longer response a week or two ago about the same issue. A cursory look at the map on which the data are plotted suggests that it is not a Mercator Projection with exaggerated high latitude areas, about which an earlier commenter expressed concern, but rather a Miller Cylindrical Projection. This projection is used specifically to reduce the dreaded distortion of area, but the correction comes at the cost of altering the shape of features appearing at high latitudes. Can someone explain how if is possible to get 1.2 lbs. of water out of 1 lb. fuel? By “Consevation of Mass”, this would seem to be impossible. Secondly, I thought clouds increased albedo by reflecting heat into space. How are these clouds different? Reply: The additional mass comes from the oxygen drawn from the surrounding air during combustion. ~ charles the moderator. The GISTEMP global dataset includes only about 30 Siberian weather stations, most of them are located in big cities and severely contaminated to some extent by artifical warming due to UHI (or bad siting). It seems to me that Hansen and his team like to use UHI-contaminated stations for ‘better results’. For example, I collected my own Siberian dataset, which includes every valuable (at least 20-year long) temperature record from the region what I can find in GHCN and GSOD. My own Siberian station log counts more than 430 weather stations with valuable historical records. Its all in the clouds! water vapor has been dropping, less clouds, more shortwave energy reaches earth. earth warms. simple. OLR has a positive correlation with temperature at all time scales, the opposite of what would occur if greenhouse warming was responsible! Water vapor has a negative correlation with temperature, the opposite of what would occur if water vapor positive feedback was occurring. Why will no climate scientist compare water with temperature? Bill Illis: Here’s the ERSST.v3b version of the Southern Ocean SST anomalies. It looks like it influences your SAMO data, which would make sense. Looking at this old currents map, the ACC (West Wind Drift in this illustration) reaches well into the South Atlantic. Somehow I missed your original post on the SAMO back in November. I know I’ve read at least one paper about THC/MOC in the oceans of the Southern Hemisphere, but it was small in the SH compared to the NH. Bill Illis: Sorry about the map link. It didn’t make the transition well. You’ll have to cut and paste the rest of it into your browser. Once again, the AGW alarmists agenda is being thwarted by facts. They’ll change their argument (see the phrase ‘Climate Change’) to fit the fact their agenda is being dis-proven by reputable scientists. We must to continue to scream loud and long because the alarmists have the ears of the incoming U.S. administration. I saw a figure, once, as to how much water vapor a hardwood tree puts into the atmosphere through evotranspiration. It was an incredible number. In as much as we’ve cut down hundreds of thousands (millions?) of sq. miles of rain forest, I can imagine that that could have some effect on temperatures. So much for the Global part of AGW. Just from eyeballing that map, it looks like half the area experienced little to no warming, with significant warming limited to NH high latitudes. Perhaps what the map is showing is the cumulative effects of thirty years of a positive PDO. It should be interesting to see what the map looks like after thirty years of a negative PDO. Perhaps the warming/cooling areas will even be inverted. I believe it is a Plate Carree projection. This doesn’t distort as much as one moves N & S from the equator as Mercator, but does nevertheless pictorially exaggerate the effects across the Arctic and Siberia. (Likewise for Antairtica, of course). Such projections seem to be used for almost all global climate related information. The experts of course are used to this – but do the general public/media know or do they largely take the picture presented at face value? WRT the discussion on man made lakes. North America used to be have a MUCH higher precentage of its surface in water – as recently as a few thousand years ago. For example, Lake Lahontan is an ancient lake that just recently dried up. It used to fill the Endorheic basins in Nevada. You can see a pic of what it looked like on its wiki page. What is interesting about Lahontan is that if man made diversions were ceased, it would begin to grow due to recent cooling in the last few thousand years. In short, the man-made lakes are pin-pricks of their former natural glory. I guess this doesn’t really surprise me much, because I didn’t expect the climate to change evenly across the globe in the first place. I envision it as more as a mosaic of changes in both directions in various regions all at once. I tend to view “global averages” as calculated abstractions that don’t mean much to individuals. Its all those years of B52 and Bear bomber flightsI I tell ya. Now days its tourists going over the pole to eat Sushi or Ski in the Alps or some such..Oops forgot the Alps are snow free according to the Nobel lauriate Gore. Over the years, I’ve noticed that there seems to be a relatively large number of “sceptics” in Australia and New Zealand. Looking at Christy’s map made me realize why that might be the case. It’s getting colder down there! The largest cloud loss occurs on a seasonal basis in the middle of the year when the land masses of the northern hemisphere heat the atmosphere. So, the northern hemisphere must warm in summer. Paradoxically the greatest effect is seen in the southern tropics where evaporation is at a seasonal low in mid year. That is where the ocean soaks up energy. That delivers persistence and warmer winters at high latitudes. Because the atmosphere has been gradually drying there is an ever larger response in terms of cloud loss to northern hemisphere land mass warming in mid year as time goes by. Because the inter-tropical convergence zone is usually north of the equator and this is where the warmest water is located and because the continents are distributed as they are, much of that warm water from the tropics moves north. Because the Arctic Ice floats on warm water it melts from below. There are other implications that I cover at http://climatechange1.wordpress.com/ including the reversibility of this warming. The relative surface pressure between the South East Pacific and Indonesia gradually shifted to a base state that is more El Nino like over the period of record. But, the guys who push the AGW agenda are obsessed with original sin. They will not be swayed by reason. And the press favors sensationalism and is therefore irresponsible. Looks like we are going down the wrong path and it will be hard to stop this train. You think northern hemisphere winter is cold this year. Unless the tropical oceans warm a little in this Southern Summer next northern winter will be colder than this one. The guys who are in a position to know these things work for NASA. No more data is needed to understand the climate system than what we already have. But these guys want the gravy train to keep on flowing. I would like to ask Dr. Hansen to plot a course from Halifax, Nova Scotia all the way down to Nassau, Bahamas. Now obviously his course would be effected by the weather and ocean currents. No problem because he is an expert! And at his disposal are all of the computer models and tools that he may need. One thing though. He cannot correct his course or take ‘fixes’ along the way. His predetermined course is all that he can use to get him safely into port. What are the chances that Dr. Hansen can accurately navigate? Zero. It is impossible to get there without taking ‘fixes’ along the way. Dr. Hansen cannot even closely navigate a vessel from point A to point B by predetermining a course. So if he cannot predetermine the course for a tiny vessel, why do you think he can sail Mother Ship Earth? How can he predetermining her course and know exactly where she will end up? Psssst. He can’t. There are too many variables. Make that a “Plate Carree projection.” Same sentiment applies( see my 1st post)! • all components of the Earth’s climate system (ocean, atmosphere, cyrosphere, biosphere) were involved in the largest changes, indicating a closely coupled system response with important feedbacks. • many past changes can be linked to forcings associated with changes in seasurface temperatures or increased freshwater fluxes from former ice sheets. Ok – the report worries most about triggering such an event through mankinds CO2 emissions and its effect on ice sheets with a lot of “if models are true then it is likely that..” and as Recommendation there is a nice wishlist for future research included. Anyhow the report suggests that climate change in the past is not so remote and unknown as some are claiming. This might have been said already… I wonder if it has anything to do with most of the CO2 emissions being from the northern half of the globe? Whether it’s a Mercator projection, an unprojected lat/long Cartesian grid or a Plate Carree projection the geographically challenged (constituting about 76.28% of the U.S. population) believe that Greenland is twice the size of the U.S., Alaska is a large as Brazil, and the shortest distance between Maine and Moscow is via Paris. The greater Repulse Bay, Nunavut metroplex goes up 4F and it looks like 15% or the planet is on fire. Ya gotta believe its done that way on purpose. Well, they say that CO2 is a well-mixed trace gas… so I guess not. Fits in with Svensmark’s GCR cloud theories. Throughout most of the last 10 milllion years or so, when the Arctic/Greenland warms, Antarctica cools. I thought the models were based on the idea thatreltive humidity will increase with global warming, forming part of the ‘fast feedback’ system that catastrophic global warming depends upon. Obama’s recent picks for science advisers suggest skeptics may be in for a rough time. They come with ready-made views on global warming. President-elect Barack Obama today named a Harvard physicist and a marine biologist to science posts, signaling a change from Bush administration policies on global warming that were criticized for putting politics over science. Both John Holdren and Jane Lubchenco are leading experts on climate change who have advocated forceful government response. The data for for evolution of humidity over time reveals a decline. There is no gainsaying that. The loss at 300hPa in recent years has been faster than ever as the tropics have cooled. The amount of water vapour in the upper troposphere is a function of the strength of convection in the tropics and the strength of the high pressure cells that return that air to the surface. With cooling in the tropics the supply is reduced and the big high pressure cells at 30° of latitude intensify their circulation as upper atmosphere temperature declines. That sets us up for the next El Nino. You can’t have precipitation without drying the atmosphere and a La Nina is a big precipitation event because there is cooling all round. End of the day you must look at the data. I always liked Buckminster Fuller’s solution to the problem of mapping the surface of the globe unto a surface that can be laid out flat. He called it the Dymaxion map, though it is also called the Fuller map. It takes some getting used to, but it largely eliminates the distortion problems about which concern has been expressed. Ron, I agree…it’s different. I think it would make a lousy weather map but could be great at representing climate. It would definitely solve the polar distortion/exaggeration problem. Seriously off Topic, albeit climate related, but may provide food for thought. If you believe the British Council, English is spoken as a first language by around 375 million people, ignoring the other 375 million who have English as a second language (according to that same august body) this means that approximately 17 % of native English speakers are UK residents. Armed with this trivia, I reluctantly pulled myself away from page 125 of the recent “Abrupt Climate Change“ document of the U. S. Geological Survey and , lacking any better distraction, idly Googled specific University Science Courses for the ‘World’ and the UK. For Biology and Physics the UK was about half of its expected quota (8% versus 17%) although Chemistry managed a creditable 13%. Engineering (all disciplines) sadly managed only a miserable 3% (Just edged out by Maths at 4%) but the real surprise came when I Googled “climate courses university” – The UK hit 58%!!! (229,000 out of 396,000). Par, at best, but that didn’t help the sinking feeling in my stomach! Happy New Year to Anthony and all at WUWT! New Political heads have exactly one chance to dig a hole. Their positional statements might be interesting then they have to sit in it. In a way this churn of heads is useful, allows change. Tut tut tut. You science chaps really must remember the real world. Of course the Arctic gets warmer, just as a town gets warmer when a new factory is built and starts operating. All year round Father Christmas and his elves have to make presents for all the boys and girls. As population increases so does the need for festive gifts. They don’t just arrive by magic, you know, they have to be made and that requires extra elves. Extra elves means more elf houses, more elf pubs, elf sports stadia, elf sewage works and elf pole-dancing clubs. It also means more elf hospitals and more advisers on elf and safety. That’s a lot of elves and a lot of buildings. Then there is the heat from the many extra toy making factories. Ice doesn’t have a hope of surviving at the north pole while population continues to increase. I simply don’t know why you feel it necessary to confuse things with talk of the sun, clouds, oceans and Al Bedo (whoever he may be). For once please be put aside your science and apply a bit of simple common sense. Think not of yourselves but of your elves. If you go from Dec 98 to Dec 97 the slope is 0.0004/ month ie 0.48 Deg C / Century. Considering the variation in the anomaly there is no detectable warming. RSS gives 3x the slope UAH does ie 0.0009/month Dec 78 to July 97. Too tired for this – time to hit the sack!! Mind you if you select some sites like Alice Springs, Canberra and Darwin, there is very little difference between 2008 and the historical mean temperatures. The BOM has some excellent data if you care to delve into it but they are very much committed to AGW so their monthly summaries will always highlight warming rather than cooling. Anthony: I think we could safely say that La Nina is definitely back and likely to strengthen? (So you were spot on before despite the protests from AGW’s LOL). Here is a thought, bad management in NASA caused the Challenger and Columbia disasters and we still have Hansen in NASA even with his “constant adjustments” of his climate programs. Shows to me management in NASA has not improved. Now we have Obama’s pick of John Holdren and Jane Lubchenco as science advisors against the daily increasing new information on climate. To me this is bad management and makes me wonder about Obama’s other and upcoming management decisions. John Holdren scares me. (i) If solar radiation was relatively strong during the past 60 years (until the recent drop-off), one might expect the polar region with lower albedo than clouds to warm, with the reverse occurring on the opposite pole, due to enhanced radiative cooling over the pole with higher surface albedo than clouds. This is related to the Svensmark hypothesis on cosmic radiation, as mentioned above. (ii) I think we’ve reached a critical point, regardless of the reason for recent warming (AGW or solar or otherwise), where the Arctic ice pack is simply melting off in a vicious cycle that warms surrounding areas due to enhanced release of latent heat and lower albedo. I’m not sure if reduced sunspot activity will be enough to reverse this cycle. I think it could replenish the maximum extent, but not reproduce the deep pack. Large areas of thicker ice have been depleted and the relatively cool summers will probably not be enough to rebuild it. It would take some serious cooling. The northern hemisphere dominates the yearly curves. Of course it is Roy Spencer who is contact for these plots. Mind you if you select some sites like Alice Springs, Canberra and Darwin, there is very little difference between 2008 and the long term mean temperatures. Is there not some umbrella anti-AGW group that could sue the US Government to prove AGW is real before they do whatever it is they’re planning on doing? It seems to work pretty good in delaying/stopping actions when the AGW group sue the EPA etc. RoyfOMR (18:31:15) : You must be wrong. There can’t be any climate or climatology courses. Didn’t you know? The science is settled!!! Which talks about a NASA-funded study back in 2004 that determined that the humidity has not gone up as much as expected. Has this gone down the memory hole? I tracked down the nasa release which is the same text, but on a page with all sorts of charts and graphs about the positive feedback of water vapor. Natch. YET NOWHERE IN THE RELEASE IS THERE ANY FIGURE QUANTIFYING HOW MUCH LESS. The reasons for the number of climate courses in the UK is our govt’s desire to save the world. We have the Met office and Hadley centre both busy proseltysing, with a chair in climate being funded by them at Exeter University who- as might be expected- have a large climate outreach dept and recently hosted a big climate change conference. They have plans to dramatically increase their courses. I saw a figure, once, as to how much water vapor a hardwood tree puts into the atmosphere through evotranspiration. It was an incredible number. Says it’s 785 L / kg for Eucalyptus with cotton at 3200 L / kg. These were randomly selected from a Google of “Eucalyptus water consumption”. Since those cut down trees were replaced with crops, the water balance would have to be figured on a species vs species basis. I’m with Eric Baum on this one. Satellite images of Asia show a huge brown cloud of soot that rises continously, drifts over the Arctic and falls. This causes the Arctic to melt, and causes the northern hemisphere, especially the northern parts of it, to absorb more heat than parts south. If we spent all of our “fight global warming” budget on reducing soot emissions (known, easy technology), this “global” warming would be completely reversed within a few years. I’m also with Nick. It’s more than coincidental that warming occurs least where we have the best temperature records, which is in the United States. With the 5 temperature-data correction factors (that NASA et al apply (not to mention the ever-evolving data selection rules), the “corrected” U.S. temperature graphs show our hottest years to be about even with those in the 30s (older graphs showed the 30s to be hotter than recent years, before additional “corrections” were implemented). These correction factors can do a lot more “good” (for the “greater good”) in places where the temperature records are more scanty (i.e. everywhere besides the U.S.). I came across a reference to soot causing the arctic to melt back in 1856 so it is a known problem. As you say it is easy to fix with current technology and would also do a lot for peoples health. I am not a scientists; however, I am very interested in learning about ocean oscillations, and how they affects the climate. You said that the Northern Hemisphere is affected more by the ENSO and the Atlantic Multidecadal Oscillation (from the northern Atlantic). Question 1: Why do you think these two oscillations have more effect on the NH than the PDO? You said the Southern Hemisphere is affected more by the Southern Atlantic Multidecadal Oscillation (the AMO’s counterpart in the southern Atlantic) and the ENSO’s impact is very low. Question 2: Why do you think the ENSO has so little impact on the SH? I may be wrong, but the ENSO tends to be around the equatorial region. Question 3: Is there a Southern Pacific Decadal Oscillation south of the ENSO? Question 4: Is there an Arctic Oscillation, and, if so, how does that affect the Polar Ice Cap and the climate in the Northern Hemisphere? I greatly appreciate your time, and invite anyone to answer the above questions. I am just trying to get a handle on these oscillations. In a Mercator projection the distance from the equator (strictly the circle of contact) to the parallel of latitude, theta, is the integral of sec(theta) from 0 to theta. Since sec(theta) approaches infinity as theta approaches 90º Ric’s statement is correct. Look at a globe. The Arctic is at the top and the Antarctic is at the bottom, right? Well, heat rises! Therefore, warm at the top, cold at the bottom. Q.E.D. Sometimes people just overthink these things. I’ve heard geologists say the current epoch of cool temperatures is largely due to the land mass at the South Pole, which allows huge amounts of ice to pile up. We might be seeing a feedback mechanism at work here. or more people looking to the sky. See http://www.spaceweather.com/ for reports and visuals. James, that is by far the funniest post yet!!!! We sometimes overlook the obvious and such clear answers are important for us all to not take things at face value. Anyway it (unfortunately) got me thinking what are the combustion properties of jet fuel. I took kerosene as a basic jet turbine fuel and decided to work from there. I found that that it has a molecular formula of C12H26 and burns to C12H26(/) + 37/2 O2(g) -> 12 CO2(g) + 13 H2O(g). I can understand 37 Oxygen atoms are bonded with Carbon and Hydrogen in a ratio 24 and 13 respectively but don’t understand why it is expressed as 37/2 O2 because that only gives me 18.5 Oxygen atoms for bonding and not 37. Ouch! I can see my silly mistake now. It’s 37 halves of O2 which is of course is 37. I was reading it as 37 divided by the Carbon and Hydrogen bonds. OK. Move along, nothing to see here. MartinGAtkins: As a chemical engineer who worked 30 years in refineries, I want to comment gently on the jet fuel combustion chemistry from above. Your chemical formula for jet fuel is not far off, but it has too many hydrogen atoms for the number of carbon atoms. As written, C12H26, this would be a fully-saturated hydrocarbon a.k.a. paraffin. However, while jet fuel does have some paraffinic constituents, it also has a substantial amount of carbon rings both saturated and unsaturated, thus the hydrogen number is somewhat less than 26. The composition changes depending on the crude oil, plus some refining processes have an influence. Further, like almost all petroleum products, jet fuel has a range of carbon numbers, typically from about 8 (although some as low as 4) all the way up to 16 or so. We blend some butane into jet fuel (the 4-carbon) to achieve the desired vapor pressure. 2 C12H26 + 37 O2 —> 24 CO2 + 26 H2O. Note that there are also other combustion products, usually NO, NO2, and some SO2, plus some un-burned fuel and some soot particles. There may also be carbon monoxide, CO.
By the way, the State of California now has official carbon-emission calculations for hydrocarbon combustion, developed as part of the Scoping Plan for Climate Change Initiative, a.k.a. as AB 32. This is the first step toward the Cap and Trade program, whereby every emitter of gaseous carbon (CO and CO2) must measure and report their sins. Measuring is required for 2009, and reporting is due in early 2010. There will be state-certified verifying agents who will check all this measuring and reporting. Gilroy is a small town just east of Monterrey Bay in California. The high levels of university climate science courses could well be the legacy of Margaret Thatcher that Richard Courtney documents so interestingly here. Thatcher used her science degree to gain global credit; at home she used it to upgrade climate science by damping grants to all research EXCEPT THOSE THAT CLAIMED A LINK TO GLOBAL WARMING – in all disciplines. the giving of grants to all disciplines could well be what first ensured a multidisciplinary basis of affirmation for AGW. This is also a form of Divide And Rule, since specialists only know their own expertise. Oh, and the Hadley centre was also Thatcher’s bequest. isnt Gilroy the garlic capitol of California? Unfortunately he based his arguments on the pre-correction MSU and the results post-9/11 didn’t bear his theory out as I recall.